They are found only on the Galapagos Island. They are closely related to mainland iguanas but are black in color instead of green. Charles Darwin was fascinated by these lizards, and rumor has it he would toss them into the ocean and watch them swim to the rocks. Marine iguanas are reptiles so they have scales. Marine iguanas can grow up to 5 feet in length. They lay between one and three eggs. They dine on algae found in the ocean, and sometimes on plants. 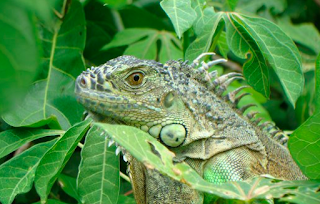 These iguanas have a symbiotic relationship with mockingbirds. Hawks can eat iguanas and mockingbirds give off a warning sound when hawks are around which helps the iguanas stay alive. Hawks found on Galapagos attack and eat marine iguanas. These lizards sneeze often in order to remove salt water from their sinus cavity. They can stay underwater almost an hour. Because they are ectothermic, they have to sun themselves on rocks often during the day. Male iguanas are larger than female iguanas.